This topic contains 4 replies, has 2 voices, and was last updated by Alan Brinton 2 years, 4 months ago. 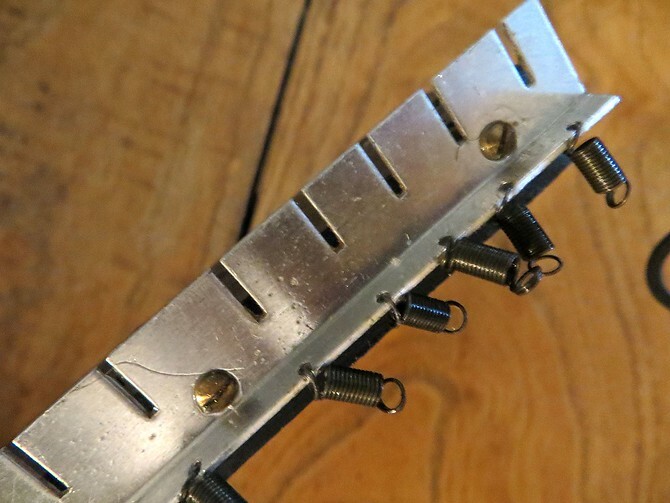 A common feature of this whole class of melodicas is the five hexagonal headed bolts that affix the inside to the bottom of the encasement. Once these are removed, the keyboard and works pops out. 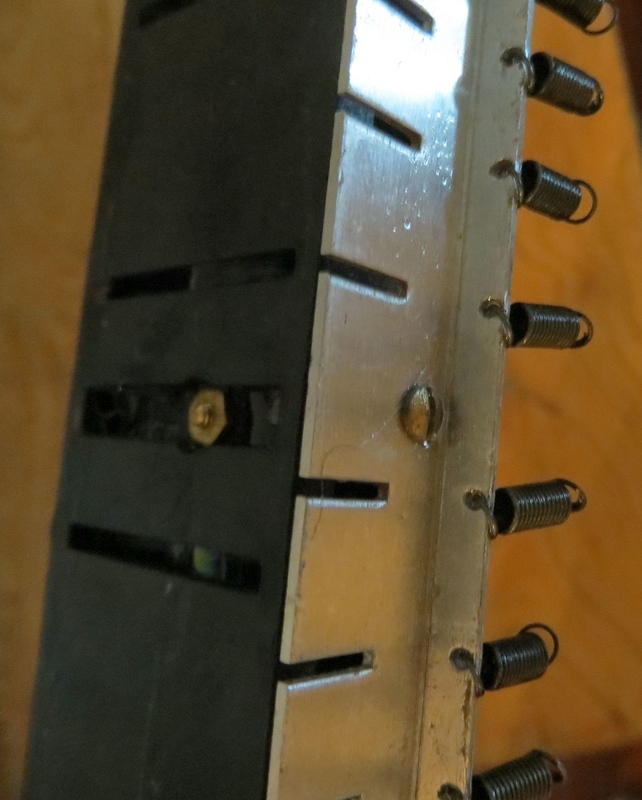 If it sticks, it can be popped loose by pushing through one or more of the bolt holes with a tiny screw driver. Here you see residue from the failed gasket. I started by giving the encasement a good wash with soapy water. The white surface is a “false” bottom. 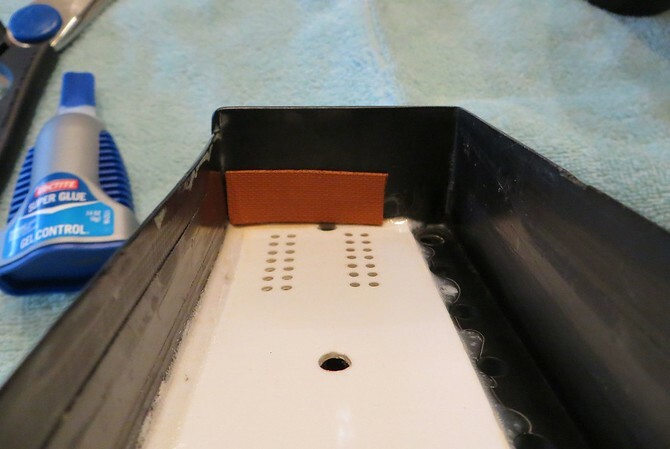 The Sorrento is unusual in that air from the mouthpiece is vented under this false bottom and then up through the pair of strips of small holes at both ends of the white surface. Some sound comes out the row of holes along the black surface at the top of this photo. I tried without success to find something about these patent numbers. Since the hand strap, which is useless anyhow, blocked some of the vent holes, I removed it. I could not tell whether there had been gasket material at either or both ends, so I added some thinking it might help tighten the air seal.. Here now is what the original main gasket looked like. It was easily scraped and peeled off with an X-Acto knife. The plastic beneath the gasket is fairly soft. So some care is in order to avoid gouging it with a sharp edge. 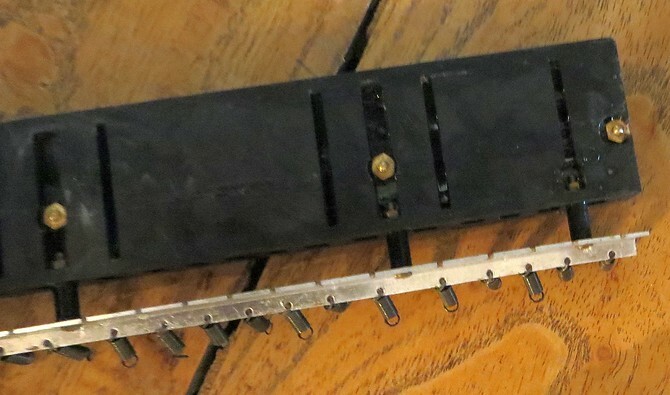 When a key is depressed, as shown here, the key pad is raised and allows air to flow to its reed. 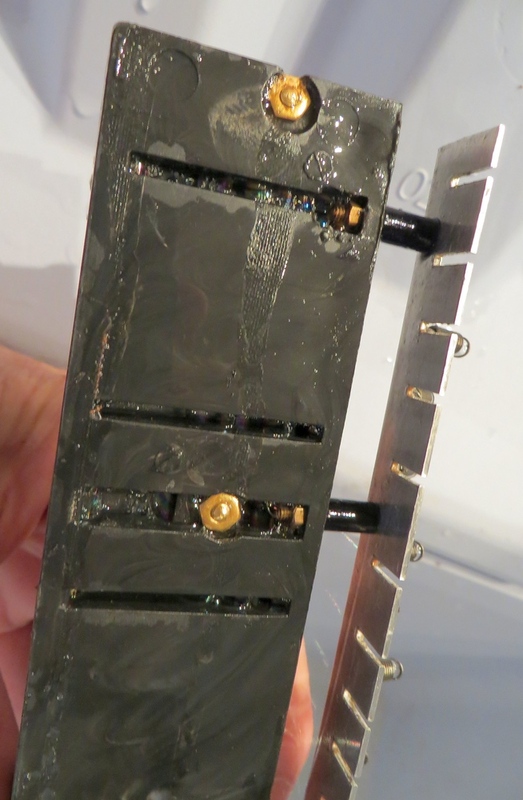 The pads can be replaced after removing the keys, I would guess with 1/16″ gasket tape and glue. Fortunately, on several different models on which I’ve been working, this has not seemed to be necessary. This Sorrento has been abused. The keys are permanently marred by the residue of number stickers, not only visible but also in terms of a rough feel, especially on the black keys. There are signs of its having been exposed to heat, as evidenced by the circles on the bottom and maybe by the texture of the key surfaces; probably it was left on the dashboard of a previous owner’s Maserati under the Tuscan sun. I have extra keys that could be used as replacements, but each key/mechanism is unique, and some bending of pad arms would probably be required to get everything to fit. The plastic surfaces also are scratched and marred. I have made no attempt to make cosmetic improvements. It’s an old beat up vintage instrument, which is part of its character. But I may see what can be done with automobile rubbing compound and carnauba wax. It is typical of this class of instruments that air is vented from the mouthpiece opening into the end of the reed chamber. 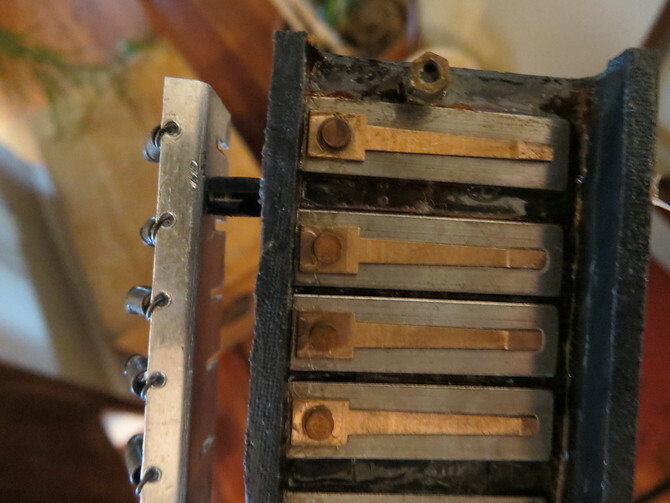 When a key is depressed, its air hole pad is lifted, and air flows out of the reed chamber, past that key’s reed, causing it to vibrate, and out its air hole. When the key is released, the pad returns to cover the hole and block the air flow. The reed chamber’s main gasket is open ended at the blowing end of the melodica, as illustrated with the Chordiana. (The ends of the two pieces are reversed in this photo.) Because the end is open, a gasket is required on the wall at that end of the instrument. I have replaced both types of gaskets in this Chordiana. The arrangement is the same with the Pinocchio Pianino, the Silvertone Junior, and most of these small key short vintage Italian melodicas. Although the reeds and reed chambers are otherwise the same for the Pianino, the Junior, and the Sorrento, in this respect the Sorrento is different. The Sorrento’s air flow comes directly from the mouthpiece receptacle through a permanently sealed channel into the permanently sealed chamber under the white floor of the reed chamber and is distributed evenly up through the banks of small air holes shown in the above photos. There are no opportunities for air to escape before it gets into the reed chamber, especially if one blows directly into the receptacle and not through a mouthpiece. 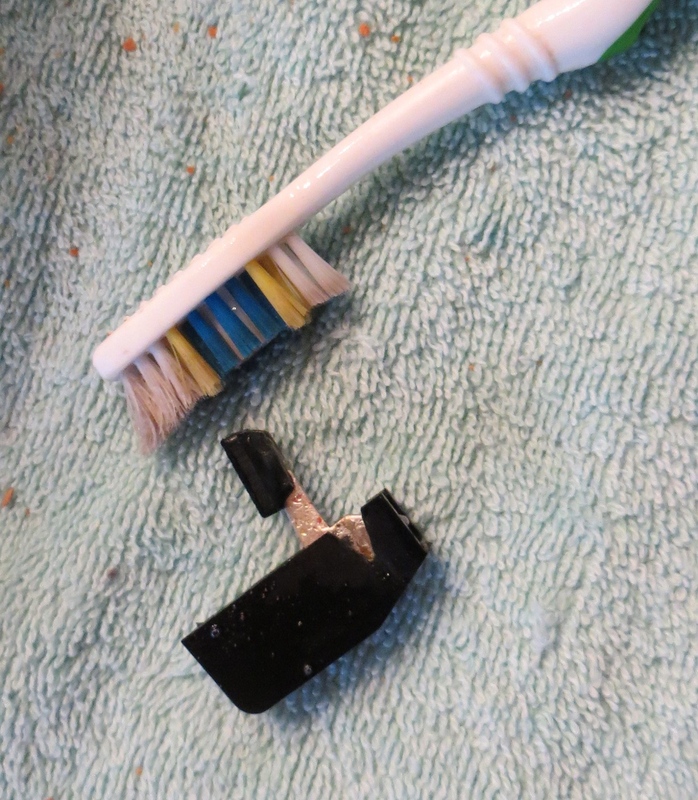 My Sorrento did not come with a mouthpiece; I have not seen a photo of a Sorrento mouthpiece, and teeth marks show that this one has been played in the past without a mouthpiece. It seems to me that in terms of air flow, the Sorrento is markedly superior in design to these other models. There are fewer opportunities for leakage. But also, the flow of air is more evenly distributed within the reed chamber. I suspect that one of the reasons it’s easier to bend low notes on a melodica than high notes is that the reeds of the low notes are closer to the source of air pressure. If this is true, then it might be easier to bend higher notes on a Sorrento. Also, it’s possible that this arrangement results in more even responsiveness of notes up and down the keyboard, which should be an improvement and make this instrument easier to play. My subjective impression after playing it (after completion of the refurbishing) alongside the Pianino and Chordiana seems to support this speculation. Returning now to the refurbishing process. There are two strips of padding that run the length of the keyboard under the open ends of the white keys and the black keys. The original strips on the Sorrento appear to be of similar materials and consistency to what was used for the original gasket. They have deteriorated and need to be replaced. Without these strips, the keys depress further than they should, affecting key control and causing a clacking sound. 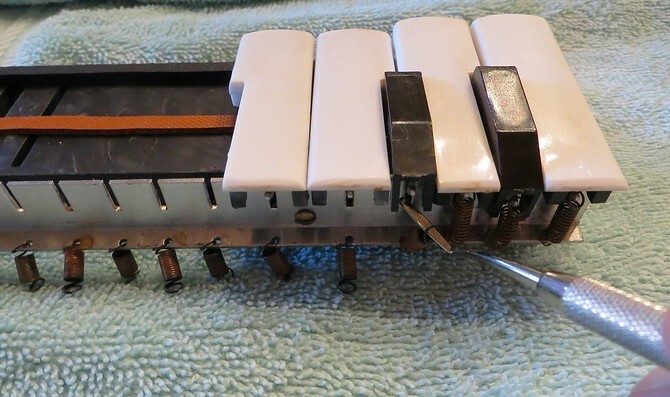 Since I have more detailed photos of some of this process with the very similar Silvertone Junior, it is actually parts of that melodica that are depicted here. These will be replaced with 1/16″ thick gasket tape of the same kind shown on the Chordiana shown above, Saint-Gobain 100S Strip-N-Stick Silicone Gasket Tape, 30′ Length, 1/2″ Width, 1/16″ Thick — available from Amazon. The red strip was probably a bit thicker than the orange one. 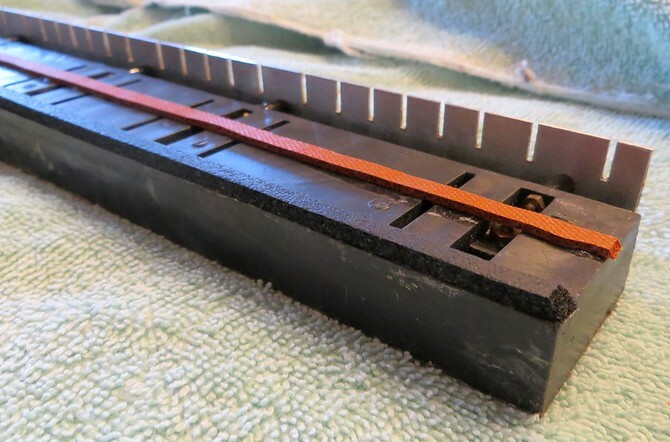 I have experimented with different thicknesses and types of materials, but on the Sorrento, two strips of the 1/16 Saint-Gobain seem to work fine, or a strip of that under the black keys and a strip of 1/8″ Veneer Supplies Vacuum Gasket Tape For Clamping. 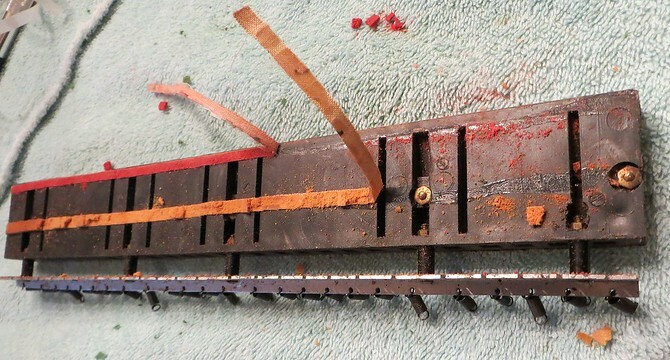 After scraping and peeling off the original strips, the keys are removed and all parts are cleaned. It is important to keep the keys in order, as some of them have been manually manipulated to get everything to work. It should not be assumed that they are interchangeable. 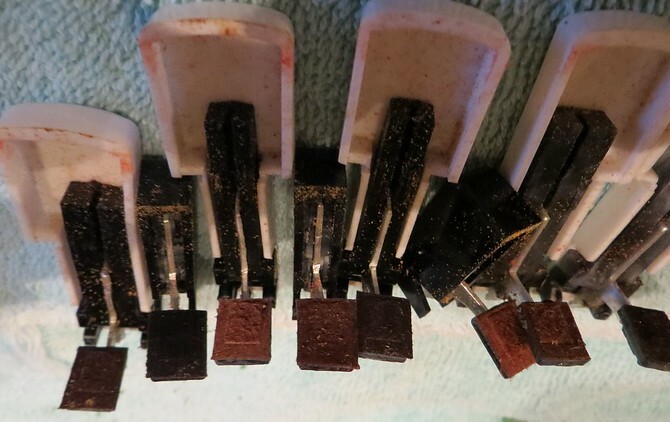 A lot of particulate debris is distributed throughout the melodica parts and mechanisms, including some on the faces of the key pads, which makes it look as though they need replacing, but they do not. 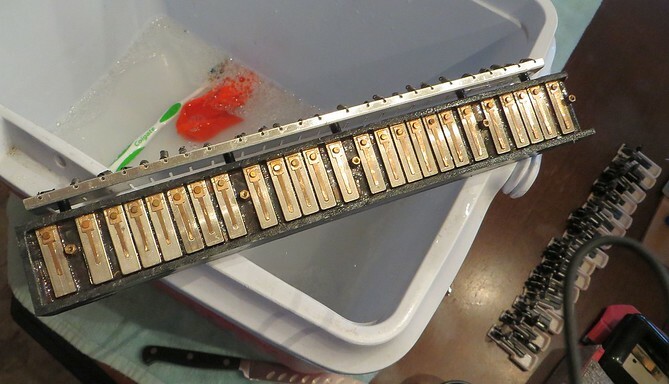 Here are the keys (actually of the Silvertone Junior) after cleaning in a 1/3-2/3 mix of household rubbing alcohol and water with a little dish soap added. More debris. 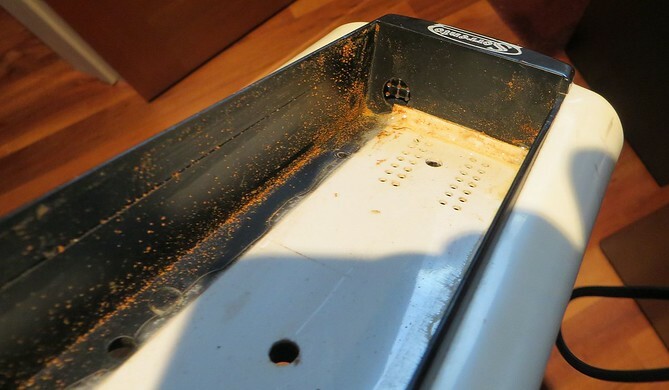 Both the Sorrento and the Silvertone Junior must have been owned by smokers, as the debris has turned into a gummy residue that’s all over the place, including in the springs. So we soak all these parts in the same alcohol/water/soap mix shown here and apply a toothbrush as necessary. Good view of the reeds here, each having its own individual reed plate, and these plates all being very securely affixed to their substratum. Unless a reed has failed, it’s unlikely to be necessary to mess with the reeds. Tuning will be more awkward in that the reeds are recessed on these instruments. I’m inclined to just leave them alone unless a particular reed is way out of tune with the others, which does not seem to be much of an issue. Now, after drying, we are ready to lay down new strips on the key plate. Notice glue residue where the original strips were. Notice also how irregular it is. This is indicative of something that’s evident elsewhere. 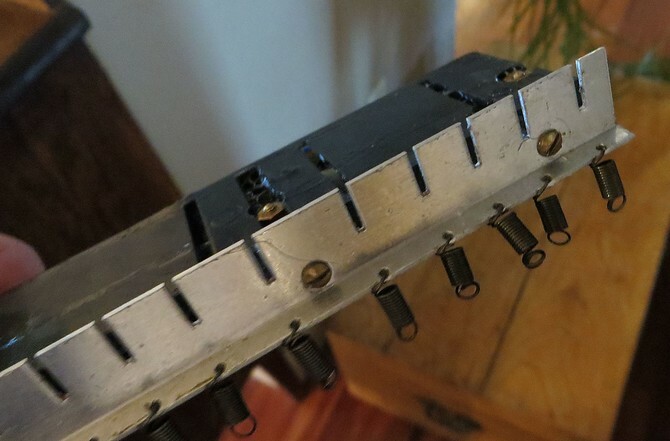 These melodicas have to have been assembled by hand. It’s especially evident with the keys and metal key pad armatures which have been manipulated, bent and twisted so as to all line up without interfering with each other. In working on the instrument, some of the same kind of manipulation is required. More about those mechanisms further along. In this case, I used the two different types of gasket tape identified above. The 1/16″ orange tape for the black keys is insufficiently adhesive and so is affixed with Loctite super glue. Now for replacement of the keys. I have found that the most convenient tool for removing and replacing these keys is the depicted dental pick. It takes a while to develop the skill to do this, but then it’s easy except for an occasional deviant spring. You want to get the spring near the end of the horizontally flat blade, rest the tip of the blade on the little catch, and snap the spring in place. Here now is a good place to take note of how to deal with a note that sounds all the time, a not uncommon problem with a new vintage Italian melodica acquisition. This could be the result of a misaligned pad, which can be corrected by bending or twisting the metal armature. But it is more likely caused by a weakened spring and can then be fixed by snipping a ring or two off the spring, which makes reconnecting the top of the spring harder but will usually solve the problem. With this Sorrento, the problem arose with an Eb and was easily remedied. It also was an issue I had to address with my Pinocchio Pianino and with a regular Silvertone Orgamonica. If there’s a note that also sounds when an adjacent not is sounded, the key pad armature of one or both keys needs to be manipulated so the pads are not overlapping or touching. Although disassembly beyond what we’ve done here is unlikely to be needed, here are some random photos showing where it could be done. Finally, we replace the main reed chamber gasket. 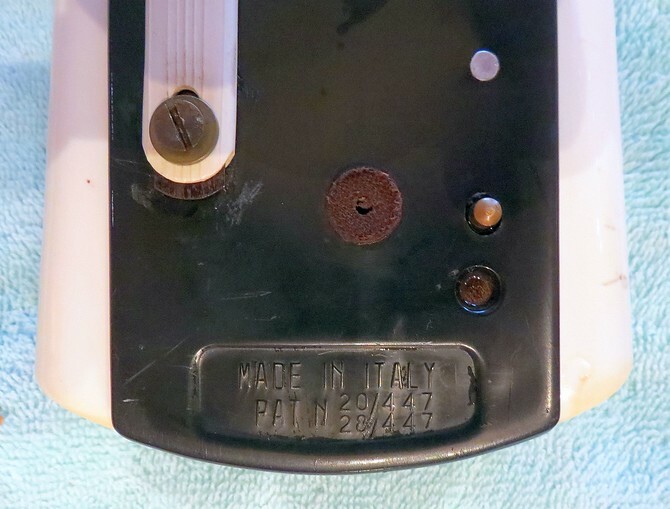 Depicted here is the replacement gasket on the Silvertone Junior. On the Sorrento there is a fourth strip covering the enclosing wall where there’s an opening on this one. We now reassemble the Sorrento. Its five main bolts may require more tightening than those of some of the other models. I recommend starting at hand-tight and then further tightening only as far as necessary to reduce leakage to a minimum. Once it’s reassembled, it’s possible that it will have to be taken apart again to make some minor adjustments. I procrastinated for a long time about trying to get any of these kinds of vintage Italian melodicas in playing condition, partly because I’m not a crafty person and was not confident about doing it. I thought about trying to find somebody to refurbish one for me, probably a European craftsman and at significant cost. Finally, I decided to just jump in, did some experimentation, acquired some of the tools and kinds of materials that seemed to be needed, and the process has turned out to be easier and much more successful than I expected. The Sorrento is especially satisfying. I bought it from a thrift shop. It was very cheap and looked like a piece of junk. I love my previously refurbished Pinocchio Pianino. The sound of individual notes on these two instruments is indistinguishable to my ear. They both produce the same lovely tones and can be played at very low volume. But the Sorrento action and sound are more consistent and more even over the whole keyboard. Working on it has made me realize that there’s more that can be done on the Pianino. I think these instruments are especially well suited to quiet, introspective or lighthearted playing. They have a very distinctive sound in comparison with any current melodicas that I know of. Nice work Alan. That Sorrento looked like it was salvaged from a shipwreck, but you brought it back to life. I am looking forward to hear a few notes from that instrument. Would you say the quality (design, construction, original materials) of these Italian melodicas in their day is generally better than the melodicas of today? I am thinking of the Yamahas and Suzukis. I don’t now, Lowboy. They are so hard to compare. Current Yamahas and Suzukis have settled into time tested designs that work very well. The materials are solid and durable. The reeds of these Italians seem to me to be superior and of higher quality; and more experimental design was going on, some of it pretty ingenious, which is more comparable to the early Japanese developments, especially with Suzuki Melodions, during the 1960s and early 70s. The gasket materials of almost all of the Yamahas (and Tokai Gakkis) and Suzukis, from the beginning, have been much more durable with few leakage issues, with the exception of the 1961 Tokai Gakki PC-1, which is more like the Italian models.